Well, the weather this week certainly indicates we’re deep into Autumn. There are leaves everywhere on the ground, it’s pouring rain, the children are wearing their boots (mostly) and raincoats and many are bringing their gloves and toques. Autumn is here and it looks like Winter is on it’s way. Inside the Kindergarten classroom, all is warm and cozy, particularly as we’re starting to talk about Bears. Through studying Bears (real and literary) and the environment around us, we’re also learning how seasonal changes affect animals, local plants and ourselves. 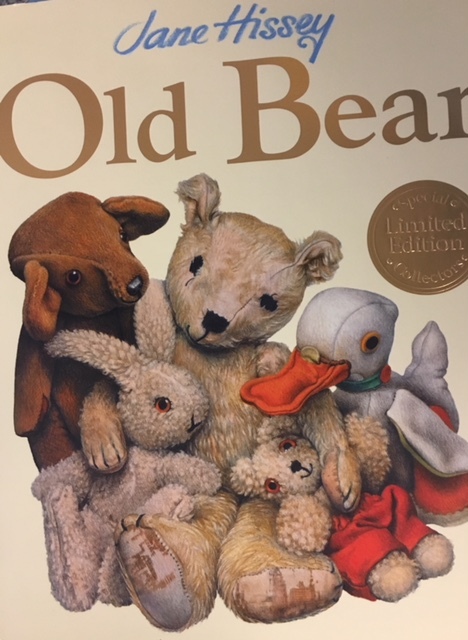 We’re reading some lovely classic stories about Bears during Storytime, including Corduroy by Don Freeman and the Old Bear series by Jane Hissey. 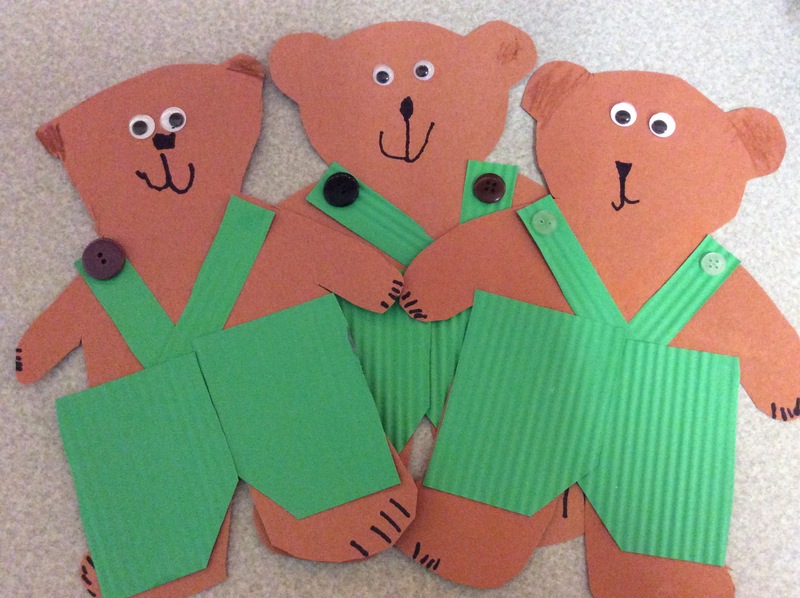 We also made our own Corduroy Bear and dressed him in these lovely green overalls. The children loved using a paper crimper to crimp the paper and give it that “corduroy” effect. Everyone couldn’t wait to select their own buttons to help the “straps” stay up. Inspired by Corduroy’s lost button, we have been teaching about sorting and sorting rules using buttons. We’ve been sorting by size, shape and colour, one rule at a time. The children were fascinated with four hole versus two hole buttons. Now, they also know that some buttons have a shank on them and are sewn on differently than buttons with holes. Of course, that led to everyone checking out their clothes for buttons and the kind they have. Sorting and classifying, and patterning are excellent Math activities to practise at home with your child. Your child probably has lots of little things which can easily be used as a collection to sort; you can take turns deciding on the sorting rule. Using the same collections, you and your child can pattern them together. We’ve completed AB, ABC and AAB patterns in class. We have been learning about creating, copying and extending patterns. Patterns in our environment exist everywhere: take a look for them the next time you are out and about. 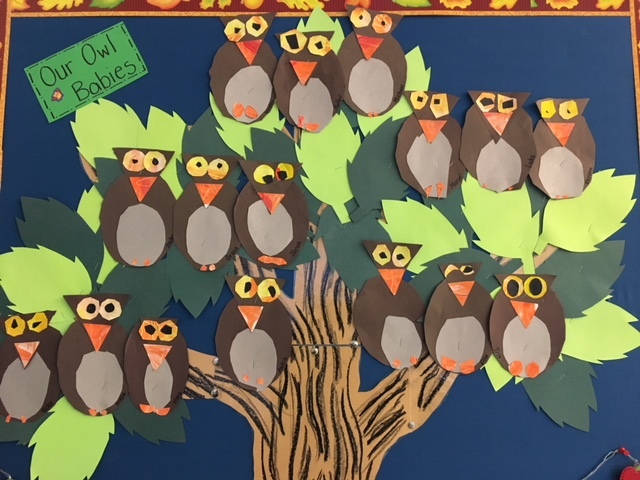 Our little bonus art activity this week was finishing our owlets. 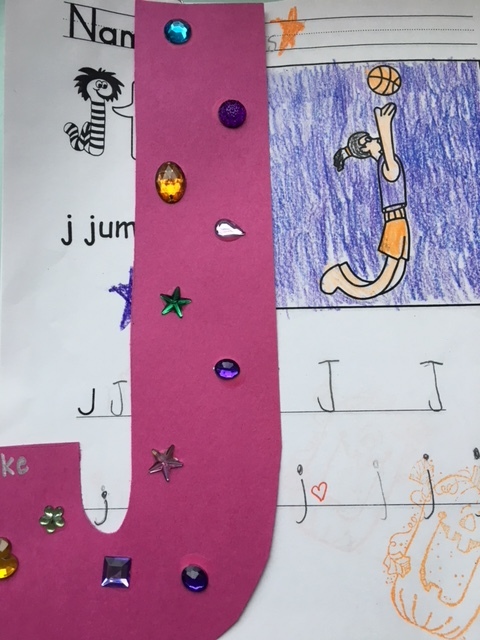 Our Alphabet letter this week was “j jumps.” But our craft was “j jewel.” It was very much appreciated by all those who love glitter and sparkle, and can never get enough. Our children are learning two songs for the Christmas Concert, “Frosty the Snowman” and “The Bells on the Sleigh.” We’re sending home the words for you to practise with your child. When we find out our costume requirements, we will let you know. Remember to save the date, Tuesday, December 19, for our Primary Christmas Concert. Christmas Sharing and Special Helper starts next week. We will send home the calendar with the date of your child’s Special Helper through Remind. Not everyone participated in last month’s Sharing so we are hoping that you will be able to help your child prepare for this next round. Please let us know if you are leaving early for the Christmas Holidays. This helps us with our planning, and we need to let Ms. Sanford, our Music Teacher know before she begins to organise the standing order for the concert. Thank you. Scholastic Book Fair: November 27-29, 2017. Please note that the Scholastic Book Fair is just three days this year. Kindergarten children must have a parent in attendance before making any book purchases; the teachers cannot buy any books on your child’s behalf. We’ve listed the Book Fair times below. It’s always a very fun event and a great way to get a head start on your Christmas shopping. We sent home the preview catalogue earlier this week.